By the Grace and Blessings of Allah (swt) our organisation, the Australian Islamic Mission, has achieved a significant milestone for the Muslim community in Sydney, Australia. 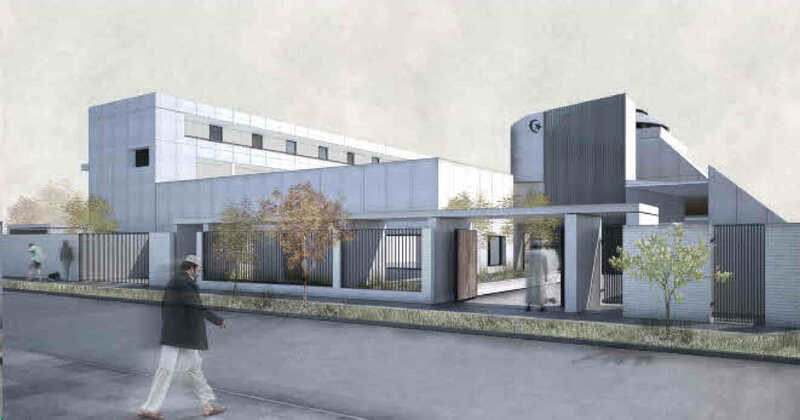 After fourteen months of deliberations, the Canterbury City Council on the 22nd of Sha`baan 1430H (13 August 2009) voted unanimously to approve our development application to build a new mosque and primary school on our premises in Punchbowl (25-33 Matthews St). This was achieved with the much appreciated support of the Deputy Mayor Mr Khodr Saleh. The buildings are arranged around a quadrangle partially open to one side which provides an internal outlook and affords privacy to students and community members; this configuration creates two adjoining but separate courtyards, providing the required separation of the primary school and the mosque. The first more public of the two courtyards is accessed directly from the street and abuts the proposed Mosque. 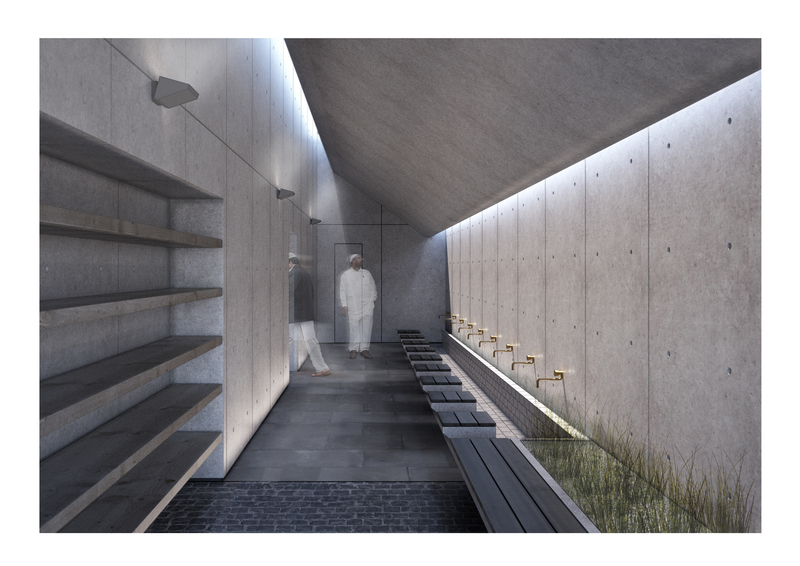 The courtyard will be used primarily as an orientation and congregation space for worshippers entering and exiting the Mosque. The second courtyard is the larger and more private of the two courtyards, accessed through but physically separated from the first courtyard. Around the second courtyard the administration building, library and school classrooms are located. The second courtyard is also proposed to be used as a playground for school children. 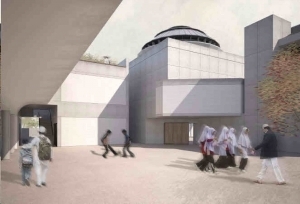 The design allows the flexibility such that the physical connection between courtyards can be widened allowing the whole campus to be used for religious teaching and other community activities outside school hours. 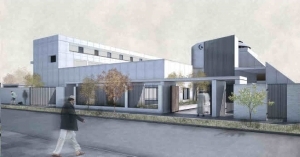 Further smaller balconies and a terrace are also proposed on the upper levels of the building to provide a number of potential external and partially external teaching environments, allowing building occupants flexibility to respond to varying climatic conditions. The architectural expression of the Mosque building is intentionally separate from the remainder of the buildings, providing for a distinct character of its own. Entry to the Mosque is via a highly detailed and delicate front façade. Worshippers will pass below expressed concrete forms adjacent to the minaret’s partially open screens (used to naturally ventilate the spaces beyond). 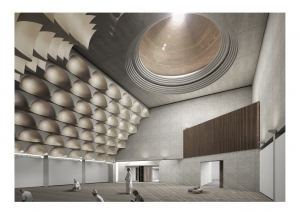 Once inside the Mosque, the off-form concrete forms continue above to form a sculptural ceiling surmounted by a stepping dome framed by a ring of skylights washing the space in natural light. A series of laser cut Islamic texts are also to be incorporated throughout the Mosque. The teaching and administration buildings are narrow extruded forms providing all spaces with dual aspect promoting cross ventilation, which in conjunction with appropriately located exposed high thermal mass surfaces, solar control devices and ceiling fans will provide a high degree of thermal comfort to building occupants without the need for mechanical conditioning of the classrooms. The roof of the Mosque is also proposed to be used for water harvesting to further reduce the resources used in the facility’s operation. 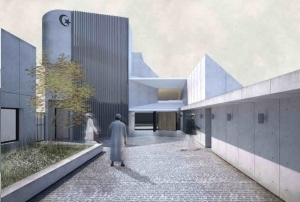 The design aims to create a centre for religious teaching and community activities to meet an existing and rapidly expanding community based congregation now and into the future.